This cherry tomato tart calls for a homemade herbed crust, heavy cream, goat cheese, Parmigiano-Reggiano, and tons of tomatoes. Here’s where it gets a little weird. In no time, the plants were off and running, even though we got them into the ground more than a month late. I mean, they were ALIVE! The cilantro, which never, ever survived our hands, was huge. The five parsley plants—we planted five because at least half always die—burst into bushes more than two feet tall. Same with the potatoes, squash, cantaloupes, watermelon, cucumbers, broccoli, heirloom tomatoes, carrots, beets, and the rest of the herbs. I finally did write home to my father and send him photos. He kept saying, “I have no idea what you’re doing, son, but keep doing it.” The thing is: We did nothing! The most peculiar were the cherry tomato plants. The One loves those yellowy Sun Gold tomatoes, and this spring he bought five plants, which was down from 10 plants a few years ago, thank you very much, because we were always inundated with baskets and baskets of cherry tomatoes by season’s end, no matter what we did. But this spring, as The One was digging in the new organic soil, he realized he accidentally bought five red cherry tomato plants. When he discovered his mistake, he looked like an investment banker who just lost his four-million-dollar bonus. I felt so sorry for him that I went back to the garden store and picked out six Sun Gold plants. I figured we’d lose half of everything anyways, as we always did, so the 11 plants would net us five in the end. Just eight of the millions of seemingly innocent tomatoes we picked this year. No such luck. All 11 suckers grew. And grew. And grew. In no time, they were up to my waist. Then my shoulders. The stakes we have are only six or so feet tall, so then the plants began growing downward. And, ultimately, across the white gravel paths. I measured one monster, and it was longer than 10 feet! I was starring in my own version of “The Attack of the Killer (Cherry) Tomatoes!” They were insatiable! I walked out back several times, hedge clippers in hand, determined to cut these behemoths in half. “Oh, no you don’t!” The One said, blocking the gate with his body. “I don’t care.” He had a mad glimmer in his eyes. Something was amiss. The One would never forsake kale. He’s too much in love with it. I had no choice. It was either them or me. That’s when I sprung into action. I harvested as many tomatoes as I could—we’re talking three or four gallons some days—and turned them into purée, sauce, and paste. I mixed and matched, making red, yellow, and orange versions of everything. I foisted them on friends. I insisted that Annie, my lovely assistant, take home bagfuls for her family. I cower inside now, afraid to walk in the garden. “What the hell else do you want from me? I’m exhausted!” I scream at them. Looking out the back window, I swear I can see them waving. Next year, we grow nothing but potatoes. What Folks Are Saying About This Recipe! “A perfect cherry tomato tart.” “Beautiful, flavorful, and delicious.” “What a great way to use all those cherry tomatoes that come flooding in at the end of summer.” That’s what folks are saying about this cherry tomato tart recipe. 1. In the bowl of a food processor fitted with a metal blade, pulse the flour, rosemary, thyme, and salt until blended. Add the butter and pulse until the mixture resembles coarse cornmeal with noticeable chunks of butter no bigger than small peas, somewhere around 13 to 15 one-second pulses. 2. Dump the tart crust mixture into a large bowl and drizzle with 4 tablespoons ice water. Using a fork, gently mix just until the mixture forms a “shaggy” dough. Squeeze some of the dough in your hand. If it doesn’t hold together, add enough of the remaining water, 1 tablespoon at a time, until the dough does hold together when gently squeezed. Form the dough into a disc, wrap it in plastic wrap, and refrigerate for at least 1 hour. 3. While the dough is in the fridge, position the oven racks in the middle and lower thirds of the oven. Crank the oven to 400°F (200°C). 4. Toss the tomatoes with a drizzle of olive oil on a rimmed baking sheet lined with foil or parchment paper and season with salt and pepper. Spread the tomatoes in a single layer and roast on the lower rack until they’re split, wrinkled, and releasing some of their liquid, 10 to 20 minutes, depending on the size of your tomatoes. Let cool on the baking sheet. 5. While the tomatoes are roasting and cooling, roll out the dough into a 13-inch circle on a lightly floured surface. Ease it into an 11-inch tart pan, fitting it snugly against the sides and bottom, and trim the excess. Prick the bottom with a fork and cover with parchment or foil. Fill the tart with pie weights or beans. (If the tomatoes aren’t done, slip the shell into the fridge.) Bake the tart crust for 20 minutes. Remove the weights and parchment and bake until pale golden, 5 to 10 minutes more. Let cool slightly. 6. Whisk the eggs, cream, sliced basil, half the Parmigiano-Reggiano, and a pinch each salt and pepper in a bowl. Pour the filling into the baked tart crust and distribute the tomatoes equally in the tart crust. Pinch off bits of goat cheese and place them between the tomatoes. Sprinkle the filling with the remaining cheese. Bake on the middle rack until set and golden brown, 20 to 25 minutes. Let cool until warm. When ready to slice and serve, dot with the teensiest basil leaves you have. This cherry tomato tart is beautiful, flavorful, and delicious. The crust has a wonderful flavor from the fresh herbs and complements the creamy filling well. I liked the idea of roasting the tomatoes first, and they were literally bursting with flavor in the finished tart. A delicious first course, or when combined with a salad, a light lunch or dinner. 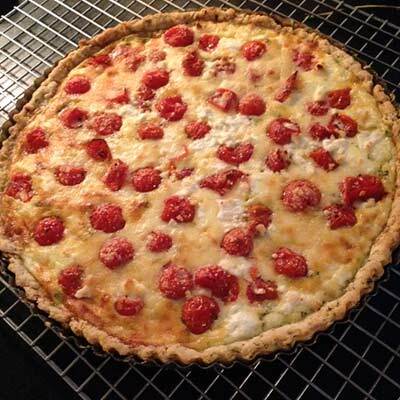 The first time I made this cherry tomato tart I had larger tomatoes and left them in for the full 20 minutes, but my tomatoes were smaller the second time around, so they were ready in 10 minutes. (I had to sneak a few off the baking sheet, and they were delicious!) The crust came together easily and was perfect. It was a bit sticky during rolling, so I ended up moving it to a floured piece of parchment paper and chilling it for about 10 minutes before baking because it seemed to have gotten a little too warm during the rolling out. It baked up perfectly in 25 minutes and looked beautiful out of the oven. The assembled tart also baked for 25 minutes and was nicely browned on top. It was easy to slice and serve. It was a thin tart, not at all like a thick quiche, but it had great flavor. 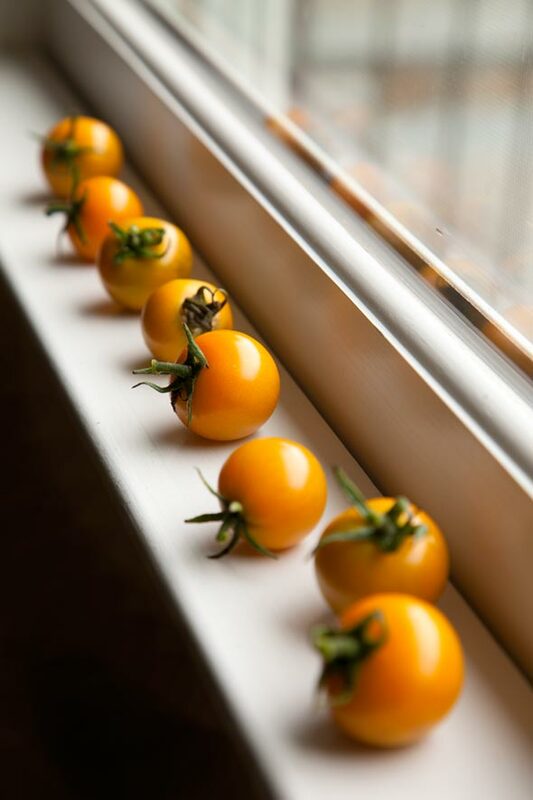 What a lovely way to use all those cherry tomatoes that come flooding in at the end of summer. 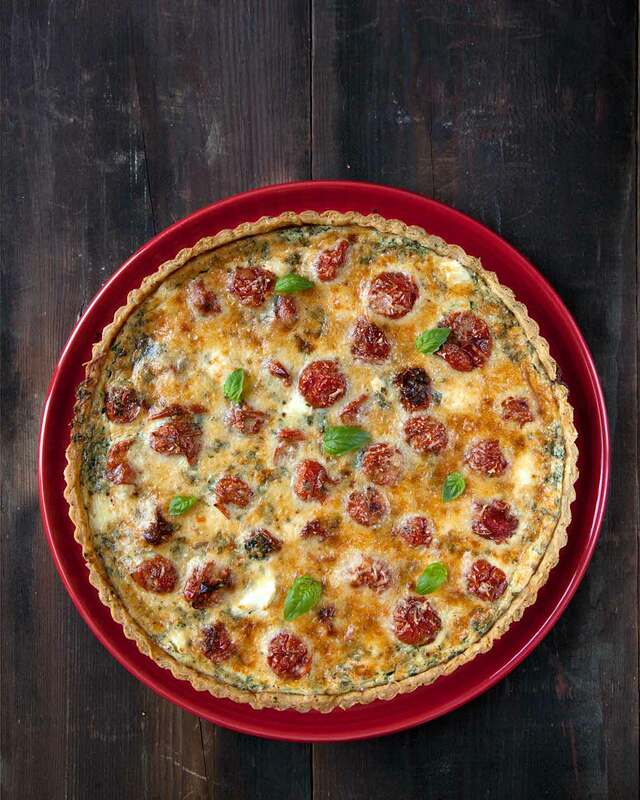 This recipe makes a perfect cherry tomato tart. Placing fresh herbs in the crust, in the filling, and on top gives it bursts of flavor even when you're not expecting them. My tart looked exactly like the photo. The baking times are correct as stated in the recipe. Blind baking the crust was essential because the filling is pretty much all liquid. As a result of the blind baking, the crust was well-cooked and not at all soggy. The tart had great flavor, and the filling was very creamy. The tart will be completely done when the top is lightly browned, about 25 minutes. It lasted a couple of days for us in the refrigerator and was easily reheated by placing it in the toaster oven on “warm – 300 degrees” for 10 minutes. You get 6 nice slices, and they make a great lunch accompanied by a small side salad with a simple vinaigrette dressing. 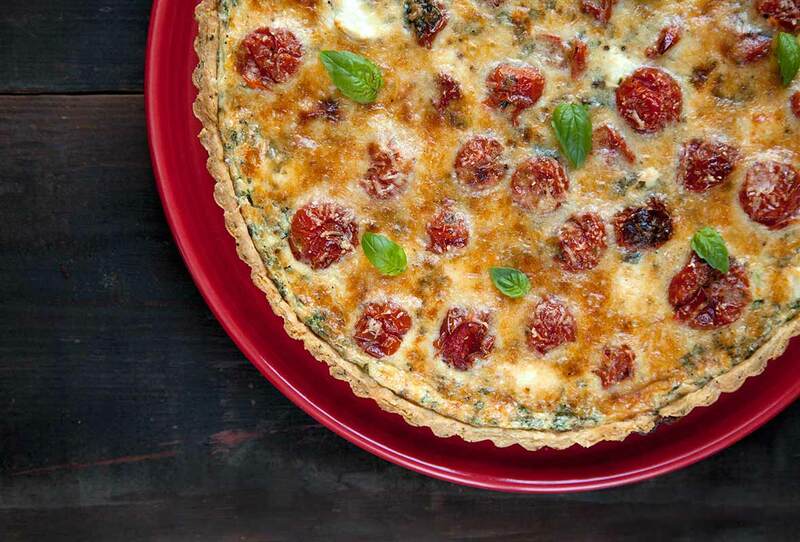 Cherry Tomato Tart Recipe © David Leite. Photos © 2015 David Leite. All rights reserved. All recipes and photos used with permission of the publisher.